Elation - Our NEWEST & completely private cabin! Amazing Cedar Sauna & Hot Tub we know you will fall in love! This cabin was just build Feb. 15, 2016! Elation is one of the most private cabins we offer near Helen, Ga. Sitting on 3 acres, you will not see any other cabins, nor will anyone see you. The Cedar Sauna will set you FREE! Totally private and cozy to bring a loved one to enjoy special memories. The Indoor Jacuzzi Spa Bath & Red Cedar Sauna will relieve your stress and put your mind & body in to a total state of relaxation. Enjoy the Outdoor Hot Tub in total privacy! Seasonal views of Mt. Yonah can be enjoyed through the 25 ft. high glass wall of windows. Inside you will enjoy luxurious leather furnishings, granite counter tops, high-speed internet access, HIGH DEF LCD flat screens with surround sound a pool table and MUCH MORE! 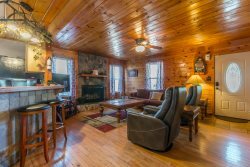 You will not want to leave this cabin, but if you do find time to venture out of your cabin, the area offers a wide variety of activities! This includes but isn’t limited to being within walking distance to our PRIVATE, stocked trout pond, Blue Creek Gardens & also walking trails! The road to this cabin is dirt. But it is well maintained. Private Stocked Pond Fishing Package: $39.00 Ask the office. Outdoor Fire Pit & BBQ. Distance from Helen: 6 min. Distance from Blue Creek Office: Walking Distance. Distance from Trout Pond: Walking Distance.